These first five years were an anguishing period of instability and humiliation. According to his biographers, Caravaggio was "needy and stripped of everything" and moved from one unsatisfactory employment to another, working as an assistant to painters of much smaller talent. He earned his living for the most part with hackwork and never stayed more than a few months at any studio. Finally, probably in 1595, he decided to set out on his own and began to sell his pictures through a dealer, a certain Maestro Valentino, who brought Caravaggio s work to the attention of Cardinal Francesco del Monte, a prelate of great influence in the papal court. Caravaggio soon came under the protection of Del Monte and was invited to receive board, lodging, and a pension in the house of the cardinal. 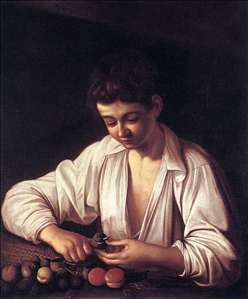 Despite spiritual and material deprivations, Caravaggio had painted up to the beginning of Del Monte s patronage about 40 works. 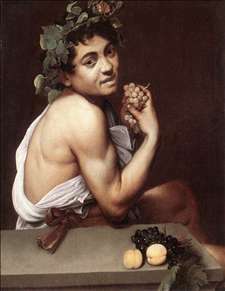 The subjects of this period are mostly adolescent boys, as in Boy with a Fruit Basket (1593; Borghese Gallery, Rome), The Young Bacchus (1593; Uffizi Gallery, Florence), and The Music Party (Metropolitan Museum of Art, New York). These early pictures reveal a fresh, direct, and empirical approach; they were apparently painted directly from life and show almost no trace of the academic Mannerism then prevailing in Rome. The felicitous tone and confident craftsmanship of these early works stand in sharp contrast to the daily quality of Caravaggio s disorderly and dissipated life. 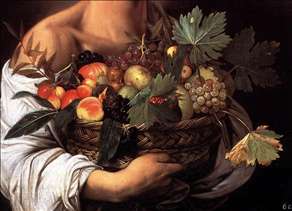 In Basket of Fruit (1596; Pinacoteca Ambrosiana, Milan) the fruits, painted with brilliance and vivid realism, are handsomely disposed in a straw basket and form a striking composition in their visual apposition. With these works realism won its battle with Mannerism, but it is in the cycle of the life of St Matthew in the Contarelli Chapel that Caravaggio s realistic naturalism first fully appears. 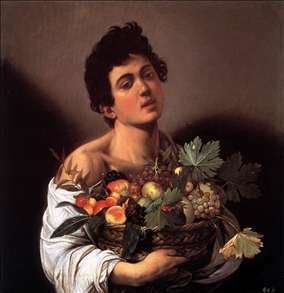 Probably through the agency of Del Monte, Caravaggio obtained, in 1597, the commission for the decoration of the Contarelli Chapel in the Church of San Luigi dei Francesi in Rome. This commission established him, at the age of 24, as a pictor celeberrimus, a "renowned painter," with important protectors and clients. The task was an imposing one. The scheme called for three large paintings of scenes from the saint s life: St Matthew and the Angel, The Calling of St Matthew, and The Martyrdom of St Matthew. The execution (1598-1601) of all three, in which Caravaggio substituted a dramatic contemporary realism for the traditional pictorial formulas used in depicting saints, provoked public astonishment. Perhaps Caravaggio was waiting for this test, on public view at last, to reveal the whole range of his diversity. His novelty in these works not only involves the surface appearance of structure and subject but also the sense of light and even of time. The first version of the canvas that was to go over the altar, St Matthew and the Angel, was so offensive to the canons of San Luigi dei Francesi, who had never seen such a representation of a saint, that it had to be redone. In this work the evangelist has the physical features of a plowman or a common labourer. His big feet seem to stick out of the picture, and his posture, legs crossed, is awkward almost to the point of vulgarity. The angel does not stand graciously by but forcefully pushes Matthew s hand over the page of a heavy book, as if he were guiding an illiterate. What the canons did not understand was that Caravaggio, in elevating this humble figure, was copying Christ, who had himself raised Matthew from the street. The other two scenes of the St Matthew cycle are no less disconcerting in the realism of their drama. The Calling of St Matthew shows the moment at which two men and two worlds confront each other: Christ, in a burst of light, entering the room of the toll collector, and Matthew, intent on counting coins in the midst of a group of gaily dressed idlers with swords at their sides. In the glance between the two men, Matthew s world is dissolved. In The Martyrdom of St Matthew the event is captured just at the moment when the executioner is forcing his victim to the ground. The scene is a public street, and, as Matthew s acolyte flees in terror, passersby glance at the act with idle unconcern. The most intriguing aspect of these narratives is that they seem as if they were being performed in thick darkness when a sudden illumination revealed them and fixed them in memory at the instant of their most intense drama. 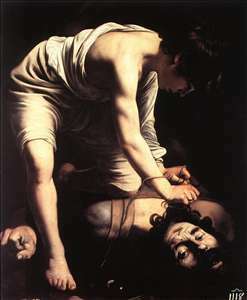 Caravaggio s three paintings for the Contarelli Chapel not only caused a sensation in Rome but also marked a radical change in his artistic preoccupation. Henceforth he would devote himself almost entirely to the painting of traditional religious themes, to which, however, he gave a whole new iconography and interpretation. He often chose subjects that are susceptible to a dramatic, violent, or macabre emphasis, and he proceeded to divest them of their idealized associations, taking his models from the streets. Caravaggio may have used a lantern hung to one side in his shuttered studio while painting from his models. The result in his paintings is a harsh, raking light that strikes across the composition, illuminating parts of it while plunging the rest into deep shadow. This dramatic illumination heightens the emotional tension, focuses the details, and isolates the figures, which are usually placed in the foreground of the picture in a deliberately casual grouping. This insistence on clarity and concentration, together with the firm and vigorous drawing of the figures, links Caravaggio s mature Roman works with the classical tradition of Italian painting during the Renaissance. The decoration of the Contarelli Chapel was completed by 1602. 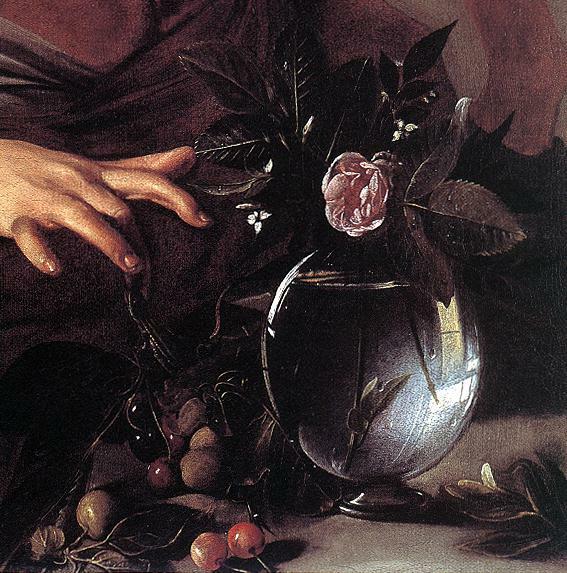 Caravaggio, though not yet 30, overshadowed all his contemporaries. There was a swarm of orders for his pictures, private and ecclesiastical. The Crucifixion of St Peter (1601) and The Conversion of St Paul (both in Santa Maria del Popolo, Rome), The Deposition of Christ (1602-04; Vatican Museum, Rome), and the Death of the Virgin (1605-06; Louvre Museum, Paris) are among the monumental works he produced at this time. Some of these paintings, done at the high point of Caravaggio s artistic maturity, provoked violent reaction. The Madonna with Pilgrims, or Madonna di Loreto (1603-06), for the Church of San Agostino, was a scandal because of the "dirty feet and torn, filthy cap" of the two old people kneeling in the foreground. The Death of the Virgin was refused by the Carmelites because of the indignity of the Virgin s plebeian features, bared legs, and swollen belly. At the advice of the painter Peter Paul Rubens, the picture was bought by the Duke of Mantua in April 1607 and displayed to the community of painters at Rome for one week before removal to Mantua. 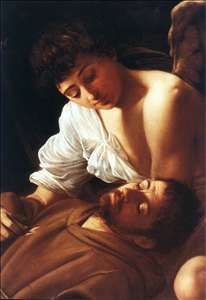 Artists, men of learning, and enlightened prelates were fascinated by the robust and bewildering art of Caravaggio, but the negative reaction of church officials reflected the self-protective irritation of academic painters and the instinctive resistance of the more conservative clergy and much of the populace. The more brutal aspects of Caravaggio s paintings were condemned partly because Caravaggio s common people bear no relation to the graceful suppliants popular in much of Counter-Reformation art. They are plain working men, muscular, stubborn, and tenacious. 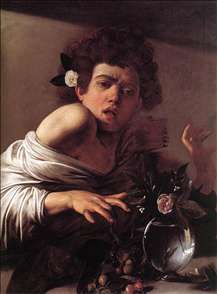 Criticism did not cloud Caravaggio s success, however. His reputation and income increased, and he began to be envied. The despairing bohemian of the early Roman years had disappeared, but, although he moved in the society of cardinals and princes, the spirit was the same, still given to wrath and riot. At the end of 1607 or the beginning of 1608, Caravaggio traveled to Malta, where he was received as a celebrated artist He worked hard, completing several works, the most important of which was The Beheading of St John the Baptist for the cathedral in Valletta. In this scene of martyrdom, shadow, which in earlier paintings stood thick about the figures, is here drawn back, and the infinite space that had been evoked by the huge empty areas of the earlier compositions is replaced by a high, overhanging wall. This high wall, which reappears in later works, can be linked to a consciousness in Caravaggio s mind of condemnation to a limited space, the space between the narrow boundaries of flight and prison. On July 14, 1608, Caravaggio was received into the Order of Malta as a "Knight of Justice"; soon afterward, however, either because word of his crime had reached Malta or because of new misdeeds, he was expelled from the order and imprisoned. He escaped, however. 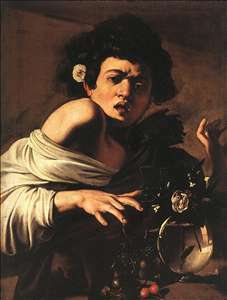 Caravaggio took refuge in Sicily, landing at Syracuse in October 1608, restless and fearful of pursuit. Yet his fame accompanied him; at Syracuse he painted his late, tragic masterpiece, The Burial of St Lucy, for the Church of Santa Lucia. In early 1609 he fled to Messina, where he painted The Resurrection of Lazarus and The Adoration of the Shepherds (both now in the National Museum, Messina), then moved on to Palermo, where he did the Adoration with St Francis and St Lawrence for the Oratorio di San Lorenzo. The works of Caravaggio s flight, painted under the most adverse of circumstances, show a subdued tone and a delicacy of emotion that is even more intense than the overt dramatics of his earlier paintings. His desperate flight could be ended only with the pope s pardon, and Caravaggio may have known that there were intercessions on his behalf in Rome when he again moved north to Naples in October 1609. Bad luck pursued him, however; at the door of an inn he was attacked and wounded so badly that rumours reached Rome that the "celebrated painter" was dead. After a long convalescence he sailed in July 1610 from Naples to Rome, but he was arrested enroute when his boat made a stop at Palo. On his release, he discovered that the boat had already sailed, taking his belongings. Setting out to overtake the vessel, he arrived at Port Ercole, a Spanish possession within the Papal States, and he died there a few days later, probably of pneumonia. A document granting him clemency arrived from Rome three days after his death. The many painters who imitated Caravaggio s style soon became known as Caravaggisti. 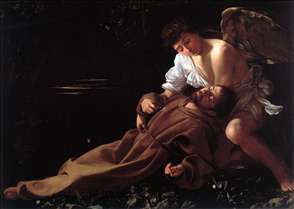 Caravaggio s influence in Rome itself was remarkable but short-lived, lasting only until the 1620s. His foremost followers elsewhere in Italy were Orazio Gentileschi, Artemisia Gentileschi, and the Spaniard Jos de Ribera. Outside Italy, the Dutch painters Hendrick Terbrugghen, Gerrit van Honthorst, and Dirck van Baburen made the city of Utrecht the foremost northern centre of Caravaggism. The single most important painter in the tradition was the Frenchman Georges de La Tour, though echoes of Caravaggio s style can also be found in the works of such giants as Rembrandt van Rijn and Diego Velzquez. See more details about "Sick Bacchus"
See more details about "Boy Peeling a Fruit"
See more details about "Boy with a Basket of Fruit"
See more details about "Boy with a Basket of Fruit "
See more details about "Boy Bitten by a Lizard"
See more details about "Boy Bitten by a Lizard "
See more details about "St. Francis in Ecstasy"
See more details about "St. Francis in Ecstasy "